I absolutely love working with these beads and, when I found them, I knew exactly what I wanted to do with them. Purchased in a variety of colors, I used these lampwork beads to design the Peony Series of earrings, filled with blooming peonies. Some of them float within water or bask in the sunlight, others hover within air or are nestled in a bed of lush green. There's five versions total in the set and these featured here are the night bloomers. 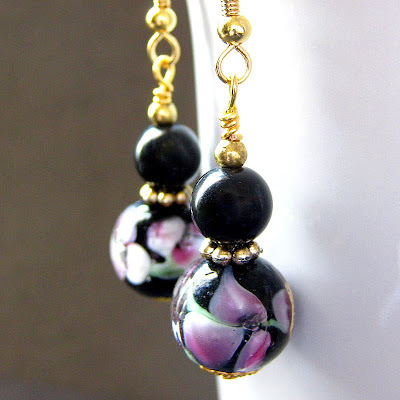 These beautiful lampwork earrings are handmade with inky glass lampwork beads filled with a collection of pink and white flower petals within the inky darkness, all dangling beneath matching black rounds. The earrings are 2-inch (5 cm) in length and are made with care to be light-weight on pierced ears and easy to wear. They're then finished with a delicate set of gold plated earring hooks.